Yanmar 4JH57CR Sail-Drive 57 HP/41KW - Alternator 125A. Latest-generation Common Rail engine with reduced emissions and consumption. Furling Genoa 106% with UV protection 41,5m2 / 447 Sq ft. In mast furling horizontally-cut in high-quality Dacron 39,3m2/423 Sq ft.
Diesel hot-air heating system Eberspacher with saloon outlets. Coachroof winch 1 x Harken 40.2ST to port. winches at the helm stations. Sun Odyssey 449 is actually a modified 439 with a great fold-down swim platform which shows quality, comfort and looks simple to use. With cleared and uncluttered deck, short handed crew will be able to handle everything with ease. Jeanneau Sun Odyssey 449 is a very nice yacht to look at both inside and out and the perfect yacht for extended cruising in comfort. This is an active charter boat and VAT is not included. Purchase dates have to be discussed with the Owner - EU based charter company. 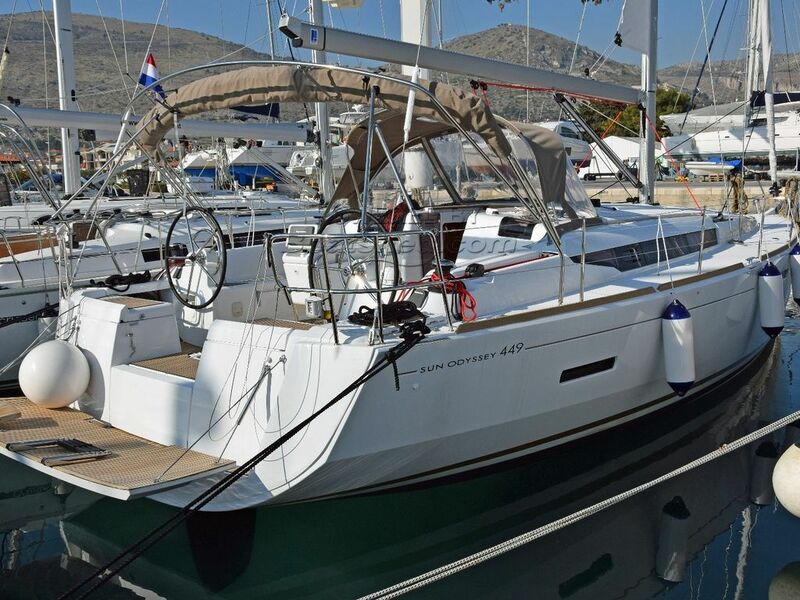 This Jeanneau Sun Odyssey 449 has been personally photographed and viewed by Maroje Mose of Boatshed Croatia. Click here for contact details.